HorseMag Blogger Template is fully responsive, technology based blogger theme which is inspired from FileHorse Blog Design. Horse Mag is solely a dynamic and futuristic blogspot theme which would convert your blogger site into a robust software/technology website. It is stylish modern, simple and elegant blogger template crafted for those who are willingly to run a successful technology website. By using this template, It will not give you only an awesome looks but it would also rank better in major Search Engines. This a first automatic blogpost template which absolutely no needs to dirty your hands with coding. The template is working almost on drag and drop. Check Documentation for using it. 100% Responsive Mobile Layout: Like HippoMag Blogger Template we have we added all the possible media quries to make it a perfect responsive theme. almost we have tested it on multiple screens like iPad, iPhone, mobile and tablet. From all these devices we came to know, that it is a fully responsive template.. Layout: HorseMag Theme is available in two different layouts Like BlogPress Theme. The two different layouts interface make a user able to select the desire one for his/her website. 1: Horse Mag Blogger Template with Flat reddish design..
2: HorseMag Blogger Theme with Blue Interface. SEO Friendly Template: Like our previous released Magazine Theme, HorseMag is solely an SEO friendly Template using light weight scripts which make it a faster template and load in a seconds. All other things are setup well for search engine like, H1, h2 and schema, hatom errors etc. You don't need to much worry about SEO. Navigation: A responsive navigation has been added at the top wrapper like Modern Themes design which would help a user to navigate the site deeply. This will not only give an awesome touch but also help to increase your website page-views dramatically. Labels : A stylish labels added similar to organic blogger theme, These label are often called tags, So user can easily jump to a specific post with the help of tagging or labeling. Here with this template you will get a modern sleek theme design label widgets. 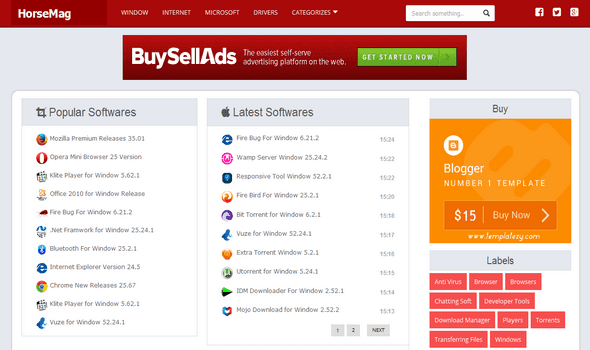 Ads Ready: Aromatic ads slot are necessary for every blog/website. 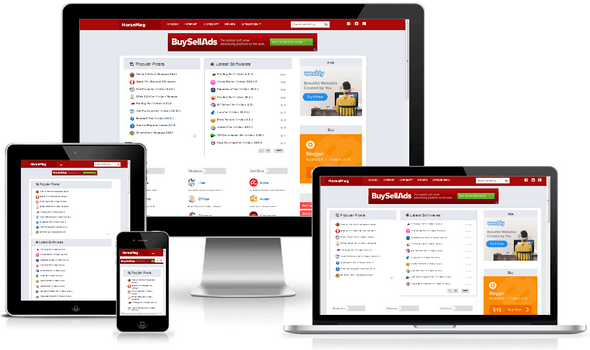 Since this template comes with lot of dynamic features which has been setup already an aromatic drag and drop ads slot. All you need to do is to copy your adsense code. Related Post Thumbnail: A cute responsive jquery related post widget has been install in the template which would display your desire posts under every blog post. This widget will only show your posts when a post is assigned by some specific labels. So, make sure you must assign at-least one label to it. We are really hopping that Horse Mag blogger template will prove our best invention in blogspot arena that ever become a true theme for those who always desired to have FileHorse similar Blogger Template for Blogspot. We hope you got the template helpful for your next technology website.